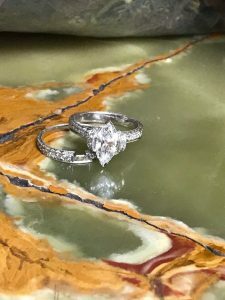 Recently, I heard a young lady tell her beau “Hold the ring in your hand… if you can’t even tell it’s there, it’s not the right ring.” While I may not always agree with that, I can certainly understand what she meant. 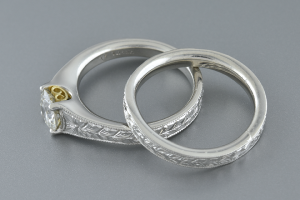 Intricately carved from half an ounce of platinum, this patterned pair exudes quality. Just look at this bridal suite, shown here in profile. These are rings of distinction. Each one features softly rounded edges that provide a truly comfortable fit. I love the contrast between those smooth polished sides and the etched surface. 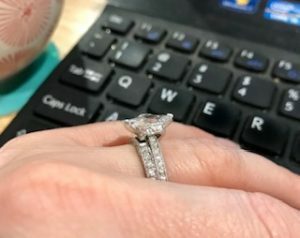 My favorite detail has to be the tiny twist of gold wire that sits below the center diamond… still visible even when the rings are nestled side by side. I love that little pop of color! A singular round brilliant diamond winks from the center of the engagement ring. 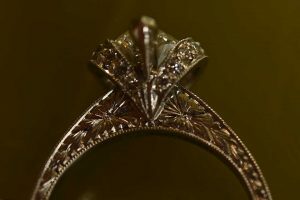 Held in place by four stout prongs, this diamond weighs .91 carat. It sparkles and shines from every angle. 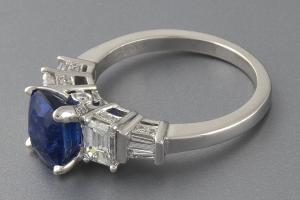 This diamond and pair of rings has been certified by the International Gemological Institute of America. 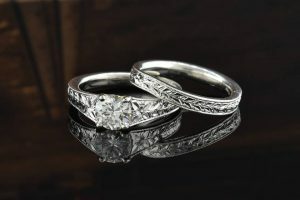 They have been valued at $12,015.00. We have them available now on our site for just $8,960.00 (a savings of over 25%)! 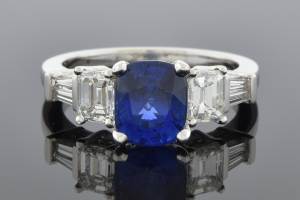 Just look at that blazing blue bauble! 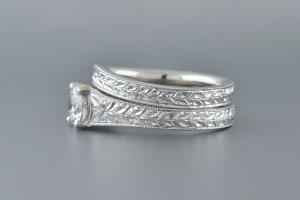 It’s flanked by a matched pair of emerald cut diamonds, giving the piece a three-stone look at first glance… closer inspection will reveal four tapered baguette diamonds nestled into the shoulders of the ring. 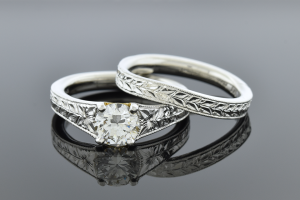 Can you see the tiny round diamonds set into every nook and cranny of those sleek platinum edges? It dazzles from every angle – and it’s designed for daily wear. 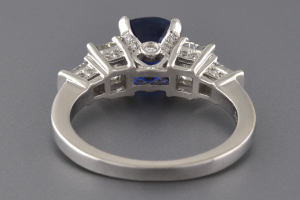 When you have a ring like this, you want to wear it all the time! 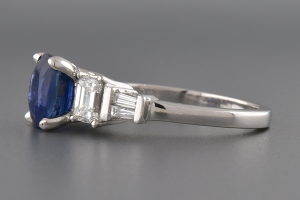 Sapphire is almost as hard as a diamond, and platinum is the most durable of the precious metals. Check it out on our site now, then some to Joden and try it for yourself. I can promise that you’ll have a case of the blues… just like me.